Unfortunately, you usually can’t make many significant purchases for under $20,000. You can renovate half your kitchen, play 400 Scratch & Wins (the good ones), or finally start the dog-walking business you’ve always dreamed of. Hopefully none of these sound like good options (or if they do, congratulations, you’re in luck!). Luckily, Go Auto Outlet has a vast inventory of pickup trucks listed below $20,000. To help you narrow your choices, we’ve selected the three best trucks available: the 2011 GMC Sierra 2500HD, 2013 Ford F-150, and 2014 Nissan Titan. Make a wise purchase decision and read the highlights of these vehicles to understand which is best for you and your family. Despite being most exotic option on our list, the 2014 Nissan Titan has proven itself time and time again on Canadian roads. Personifying Nissan’s reputation for Japanese-esqe reliability and low cost-of-maintenance, the Titan is a very high value truck. But don’t let it’s Eastern roots fool you– the 2014 Titan is very well powered. A 5.6L V-8 provides 317 hp and 385 lb/ft of torque, well earning its place in the full-sized pickup category. But at 18L/100 kms, be prepared for a thirsty truck. This particular model is loaded with a number of features. LCD display, adjustable pedals, and steering-wheel audio controls make for a relaxing driving experience. Or get your blood pumping with the Titan’s 4WD and electronic braking system. This model comes with the utilitarian crew cab short box configuration, and includes oversized aftermarket rims. Contact a sales associate at Go Auto Outlet Red Deer to learn about additional accessories and capabilities of this truck. The 2011 GMC Sierra 2500HD makes work fun without making fun feel like work. 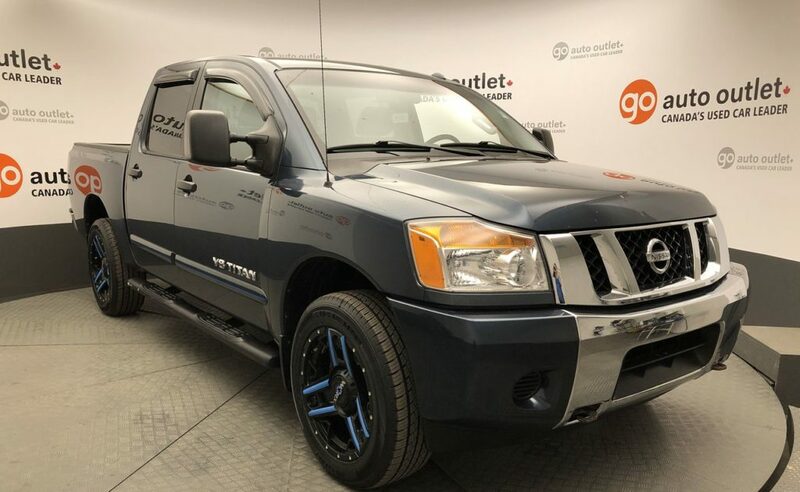 Listed at Go Auto Outlet for only $15,900, this is a very capable truck for very little cost. A 6.0L V8 producing 360 hp and 380 lb/ft of torque can handle nearly any towing or payload hauling you ask of it while 4×4, enhanced brakes, and stability control makes any worksite easily accessible. If you’re doing more family dragging than trailer towing, A/C, seating for six, and extensive legroom will keep the everyone happy on long trips. With so many features and such a low price, contact Go Auto West now to book a test drive while it’s still available. Finally understand what country artists are singing about with this ‘lil red Ford pickup. 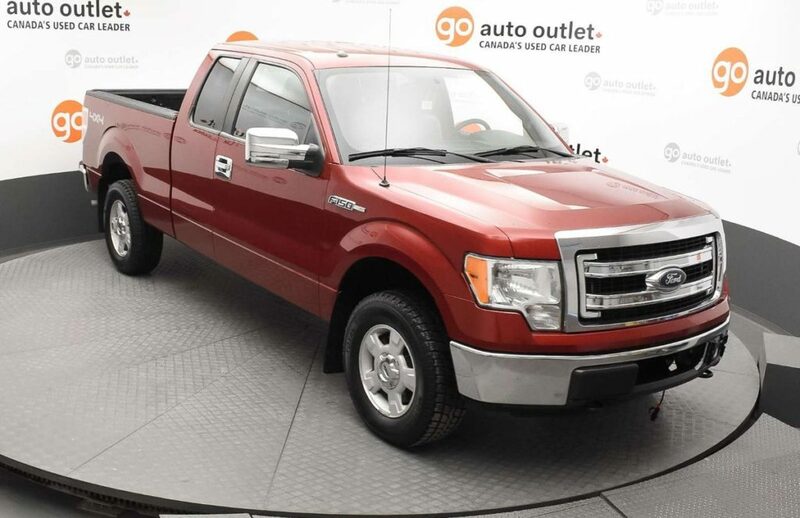 For $18,900 at Go Auto Outlet, you can own your own Ruby-Red 2013 Ford F-150 XLT. As Canada’s best selling full-size pickup, it’s alway a good decision to purchase an F-series truck. With a combined fuel economy of 18 mpg, the 3.7L flex-fuel engine (also used in the 2013 Mustang) is the perfect blend of power and economy. Producing 302 hp and 278 lb/ft of torque the F-150 is prepared for jobsite towing, highway driving, and everything in between. The XLT trim offers drivers premium features including voice activated SYNC, back-up cameras, keyless entry, and an exterior chrome package. Additional safety features include electronic sway and roll stability, Anti-Lock braking, and SOS crash alert. IIHS named the F-150 a “Top Safety Pick,” so you can rest easy enjoying these features with your family. Move ahead with a great deal on a beautiful truck, and contact Go Auto West today. There are a number of great ways to invest $20,000 at Go Auto Outlet. Visit any of our three full-service locations and ask about the truck that best suits your needs, or call today to book a test drive at a time that works for you!